As many people already knew, the library is now involved in the plans to redevelop Spirit Square as a mixed use block. The plans are now being formulated with the help of a community task force involving members of the neighborhood associations from First and Fourth Wards. The idea is that while the historic church that houses McGlohon Theater is retained, that the rest of the public land be redeveloped. The goals are to rebuild the library space, the arts space, while partnering with a private developer to build a mixed use tower above the arts space. The resulting private space can then help offset some operating costs for the facility, while also gaining tax revenue to help fund the operating costs for the arts groups and the library. As part of the land swap, however, the county now has full ownership of the site, rather than sharing it with the city. The library would not only be able to expand and update its space, but it can now explore more modern space designs, such as modeling it after a book store. It is possible that the library will end up retaining their footprint, but it is expected that these will merge into a single project plan. Wait, does this mean we're getting a new and expanded main library? I'm a bit confused. Maybe. It means that the Library and Spirit Square are looking at all possibilities to optimize both buildings and the entire site. That might mean a completely new building...or a renovation of the current one....or it might mean nothing happens at all. What I wish would happen is a completely new main library. The current one is very dark and closed...not a very inviting place. Not a place you want to go to...but rather have to go there if you are looking for a particular book or document. We need an interior community space in downtown Charlotte. A place where you want to go hang out that is open and accesible to all people. No surprises. Its old and crappy so knock it down. This isn't really like the old-so-tear-it-down stuff we're used to. The century old First Baptist Church that is central to Spirit Square will remain, it is just the building that faces into the parking lot that takes up 1/4 of the block that is being discussed for replacement. I'm not sure exactly when it was built, but I don't believe it is more than a generation old. The library building is from 1960 and is not of much architectural significance at all. These buildings have active public purposes and it seems perfectly reasonable to rebuild those spaces based on the needs of those organizations for the next generation, while also partnering to build condos, apartments, or offices above to return the land to a taxable state, and to add density and activity to the area at more hours. How great would it be for the library to use bookstore-like design with a grand entrance on Tryon and designing flex space that can be used for the library and for the arts? They could have a parked deck within the block to support not only expanded convenience for visitors going to Spirit Square and the library, but also to Carolina Theatre across the street? Having the library and the Spirit Square site could allow for a large underground parking deck, while that would not likely be possible with only the Spirit Square land. A mixed use project like those that are now be conceived as possibilities could allow for great street spaces that could allow for organic expansion of some of the night life uses across College Street. Having the library site involved could also create the possibility for two towers above the library and arts space. You could conceive of the possibility of having a condo tower at College and 7th and a modest office tower at College and 6th or along 6th reaching closer to Tryon or something. The part that is being discussed for redevelopment will not be much of a loss if there is a way to effectively fund the rebuilding of the space by selling the land. If we want to be considered a world class city, we need a world class library. I would love to see the main library renovated and expanded or even torn down and made into a tower like most university libraries. How about pairing up with UNCC since they are going to have a campus a few blocks away or someone to make this happen. I've known about this for a while, but had been sworn to secrecy (read: don't talk about it on the Internet). The committee has traveled extensively all over the USA looking at other library facilities. They've looked at Seattle, Salt Lake City, Minneapolis, to name a few. Not only has the group discovered how woefully inadequate our current library is, they have been shown the architectural light. 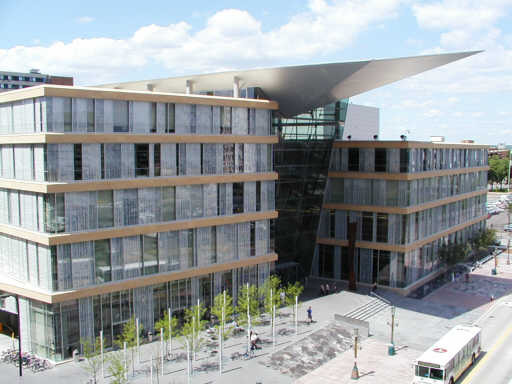 They were very impressed with Cesar Pelli's Hennepin County Library in Minneapolis. Let's just hope this means we're going to get some hot modern in an uptown public building. That's a beautiful building, inside and out. I was really hoping that our uptown library would open up and switch to mostly glass. A key component to a world-class library would be in opening the outside to the inside, and vice-versa. You want to give an enviornment capable of learning outside and in. As I recall they seemed to focus on Seattle and Vancouver more than the others. I agree that Charlotte's library is pretty inadequate for a city this size. 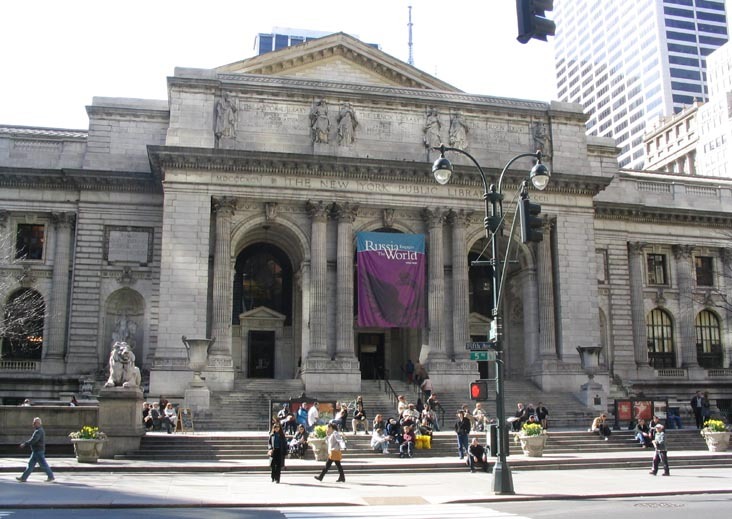 Even Columbia has a much better library, and theirs would be more appropriate for Charlotte. I think that if they recombine ImaginOn with the main library and make it a great public space that works better than the current library and has some street retail on Tryon and perhaps 6th as well, then this could really be a benefit to Charlotte. I hope that they build the next library to last a lifetime and not just for 30 years. I'd love to see a coffee shop and something like a game store or a technology store at the base of a library. It would compliment the space perfectly, as well as serve the appropriate audiences. I agree, an overhaul of the library is long-overdue. What better time than the overhaul of Discovery Place. One question.....I know these glass buildings are all the rage, and I like the design. My question is there any glass that is 100% resistent to all solar rays? Allowing books to be continuously bathed in sunlight would be pretty poor planning unless they are assured no damage would result. A new library would be amazing! I drove by Seattle's a couple of summers ago - it's totally glass. It kind of reminds me of the Hearst Tower in NYC, except a low-rise of course. The answer is yes- there are various films and methods used to protect the library books and collections from the sun. Another method that can be used is by strategically placing solid barriers where the sun would hit the surfaces throughout the year, and make the rest glass, or use angles to that would allow light in and to reflect but block any direct sun. This is the fun part for the architect. I hope we get a daring and edgy new library. I am so sick and tired of reading rave reviews about new modern libraries in Minneapolis, Denver etc etc in The New York Times. These are cities we should at least be competitive with. When is it going to be our turn for some glory? Is it just me, or are libraries these days much more symbolic than they are functional? Well I think libraries are just changing, I know I can remember going through grade school slowly using less books as a resource when the internet provided more and more information, easier, and updated. Libraries are part of a trend that are becoming centers of not just books, but information centers for research, relaxation and enjoyment, and unlimited resources for anything that may spark your interest. Considering bookstores like Barnes & Noble and Borders are still highly relevant in the marketplace, libraries can be just as relevant in the public arena. 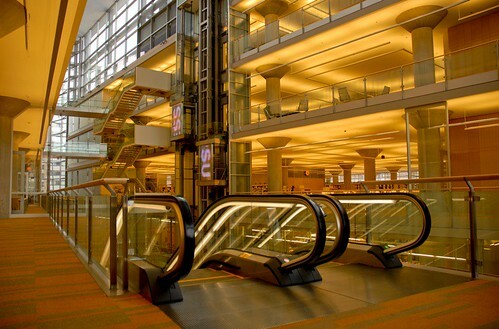 However, given the seismic shift in the process of getting information in the past generation, the designs of libraries must undergo a large change to stay relevant. I have been in a bookstore hundreds of times since I left college, but in the library only four or five times, and all of those times I have been in the library have been in the past year when I was discovering the microfiche in the Carolina Room. However, all that microfiche should be entirely converted to digital images. Most of the microfiche I searched through had streaks across it caused by the machines to view it. Printing that information from a microfiche was like a trip back in time having to experiment a half dozen times to get the right xerox tone and contrast. The viewing of it reminded me of an ancient reel to reel projector that we used to watch out dated videos on in elementary school. This information should be digitized and made available online. Frankly, Google and the internet has taken over what most people used to use the library for. I think that the library needs to do a huge navel gazing session to determine what is really needed now that the digital age is firmly upon us. The library needs to be a factory of digitization and organization of our local pool of original content, such as that which is available in the Carolina Room. Google and the general internet populace is doing the work already to organize the world's information, so the local library needs to do its part for the local information. The library also needs to take a page (yes, I intend that pun, I'm not proud) from the playbook (pun also intended, why not) from bookstores in the way to market book. Bookstores are possibly the best example of a private marketplace that actually serves a public purpose in increasing knowledge, education, and readership. That is the same purpose of libraries, only libraries pursue the notion of increasing access by sharing the books among any that want it. When you walk in the public library on 6th Street, the first thing you see is the security system and the check out desk. Ironically, the last thing you see are books. If you walk into a book store, not only is it inviting, but you can see with a survey of the eyes what others are reading and discussing at that point in history. When you walk around a public library, you get the sense of what people were reading 10-20 years prior. On Family Guy the other day, they referred to libraries as places for homeless people to go BM. Frankly, I think that cuts to the chase (to an extreme) of what libraries have become. They have, like buses for transportation, become places for poor people to access books and information, only they get it in a lower quality way than people who can afford to buy it for themselves. Right now they are symbols over substance, but I think by given a chance to rebuild the space to rebuild the space for what people need in this day and age out a library will go a long way. Other cities have done this well, and we can use architects and consultants to bring that type of design here. I think that the statement that libraries are becoming irrelevant is actually quite wrong. The other day, I went to a public library (here in Wake County) for the first time in years. The (brand new) Western Wake branch library. It was bustling. Probably 3/4 of the people there were children with their parents, there to get books, or participate in afterschool activities, or do homework, etc. Lots of parents still encourage their kids to read; This library doesn't dedicate a whole lot of space to just bookshelves; this is an admission of exactly what you're saying, the way we access information has changed and is continuing to change dramatically. But there were adults there too. One really nice thing about the library that some people don't think about is, for example, they have a pretty damn good selection of books on tape (those things are EXPENSIVE to buy, even if you buy them online). In addition, libraries have subscriptions to magazines, newspapers, online archives and journals that you would otherwise have to pay to access, etc, etc. They give free access to materials that would otherwise be very expensive to use. Sometimes it's easy to forget, but a quick google search does not provide the answer to all questions. Particularly when you want or need reliable, citable, peer-reviewed answers. No, we're actually going back in time. Can one get more symbolic than the NY Public Library? New designs are simply modern interpretation of the past. Libraries are supposed to inspire. I love this image. It's like a church for books. Books were the only way to convey knowledge for centuries and a building like this pays respect to that. I guess this is why I like classic designs for libraries, there is a certain respect implied much like churches, universities and courthouses. To me modern architectural expressions fit better with civic projects like museums, aquariums and sports facilities. Good libraries really do have that sense of being a church for books. 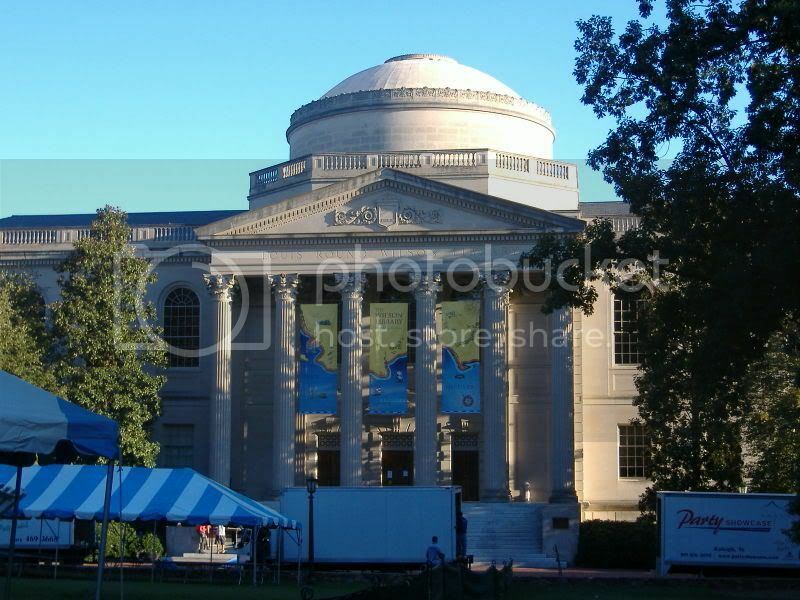 I remember in college, in Chapel Hill, going through Wilson Library and I'd pull out a book published just after the civil war and see a stamp about being bequeathed to the library in the 1870s and thumb through the fragile pages reading fascinating stuff about the subject I was researching. The thoughts passed through my mind the whole time that I was discovering something that had been forgotten and was hard to find otherwise. I also felt priveleged that I was able to have access to such a valuable artifact. Frankly, I don't find it that awe inspiring to walk around the main branch in Charlotte. However, today, this came up at work without me bringing it up. An Indian coworker working for a year here is awestruck by the library system we have here [and take for granted]. He said he takes the bus downtown to the library every week and checks out a book to read over the weekend and the associated movie to compare his imagination with that of the director. Another coworker that moved here last year said he also went to the library a lot when he was first here and also thought it was good. I think if we took it to the next level, we'd actually start pulling in more of apathetic people that otherwise take it for granted. As for the symbol over substance, in some cases, especially in the 'inspiration' industry, symbol is perhaps as important as substance. When you put kids in a warehouse-like school buildings with few windows, concrete walls and floors, (or walk through mud to their classroom trailers with ceilings that sag and off-gas fumes) they are not as easily inspired to learn or participate in the core mission of that school or library or museum. ^ Agreed that Wilson is amazing! The NY library kinda reminds me of Wilson...so classic and elegant.